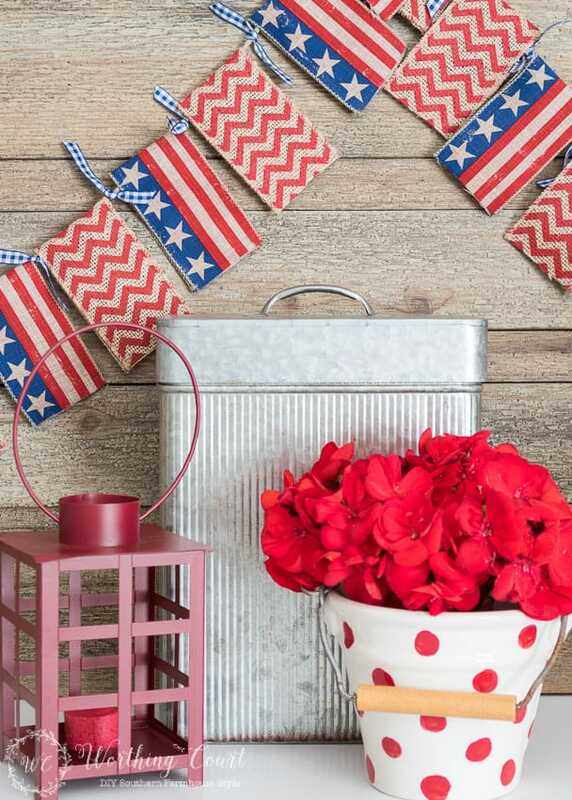 The patriotic holidays – Memorial Day, Flag Day and July 4th – will be here before you know it! For this week’s edition of The Best Of Worthing Court, let’s revisit a super easy garland idea that I came up with. 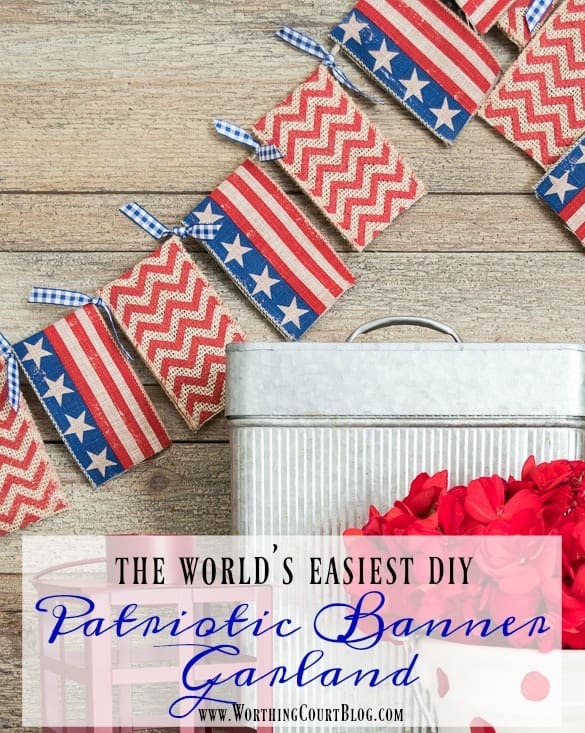 If you love a quick and super easy craft, you’re going to love this easiest in the history of ever banner! This garland can be adapted for any season or holiday and can be made in a matter of minutes. 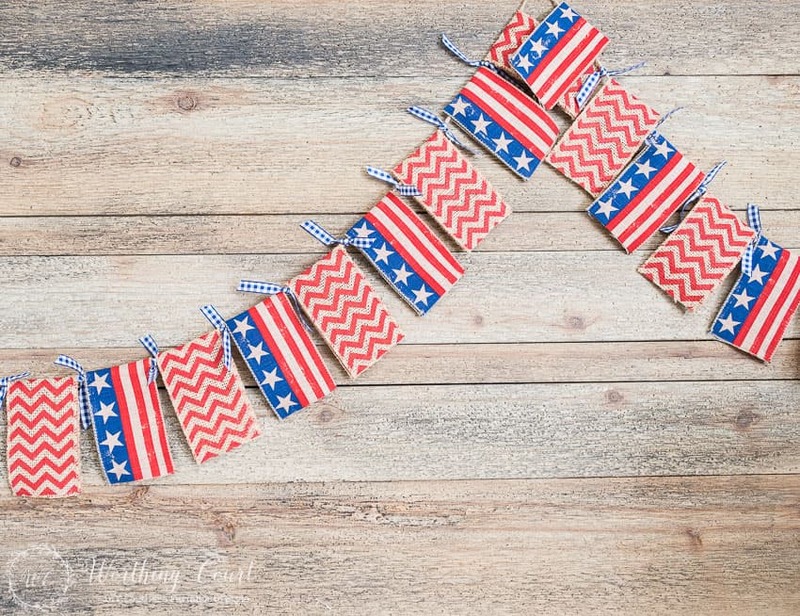 If I had thought of this method for creating a diy banner garland before now, I would have been a banner garland making diva a long time ago! I would have been churning out banners for every single season, holiday and get together. No sewing, no template using, no shape cutting required. Perfect for my simple craft loving self. By simply changing out the ribbons, you can create one for any occasion or season. I chose to give my garland a farmhouse vibe, so that it would fit in with the rest of my decor, by using ribbon that has an antiqued appearance. 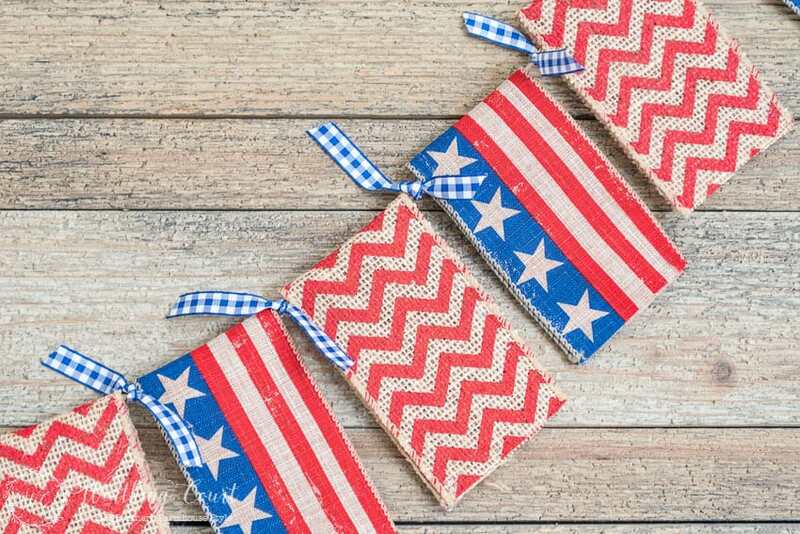 2 Patterns of 2½” Wide Ribbon With Wired Edges – The amount of ribbon you need will depend upon the length of the garland you want to make. 1 Pattern of ½” Wide Ribbon Without Wired Edges – The amount of ribbon you need will depend upon the length of the garland you want to make. This garland is so simple to make, that it probably isn’t necessary for me to give you a tutorial. You can probably tell how I made it just by look at the photos, but here’s a little explanation. Step 1: Determine the length of the garland banner that you want and cut a piece of jute twine to the needed length. Tie a small loop at each end to aid in hanging the garland. Step 2: Cut enough 12″ lengths of both patterns of the 2 1/2″ wide ribbons to fill up the length of jute twine that you cut. Cut the ribbon straight across. Step 3: Alternating patterns as you go, fold each cut piece of the wide ribbon in half, over the twine. Secure with a small dot of hot glue in the bottom corner of each folded ribbon piece. Step 4: Cut 4″ lengths of the 3/8″ wide ribbon. Tie a cut piece of the ribbon in between each of the wide ribbon pieces. And that my friend is it! Hang your garland banner for all to enjoy! 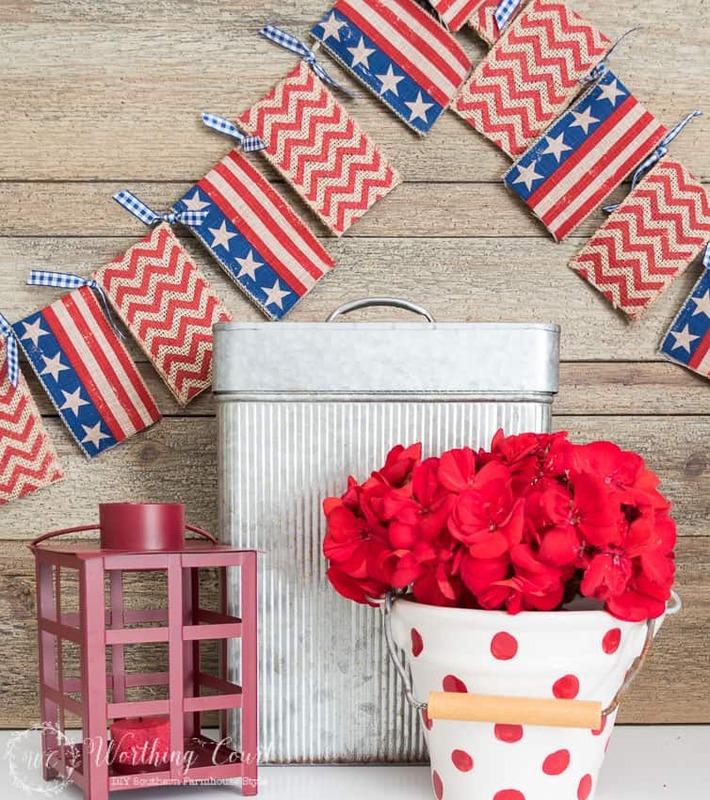 This garland is too cute (and easy to make)!!! Thanks for sharing! Thanks!!!!! So cute and easy!!!! Great idea – thanks for sharing. So quick and easy to make. Thanks for sharing, enjoy your day. Good idea for a quick project that looks festive. That’s super cute and looks easy to make. Can you comment on your accessories in this post? Very cute bunting, Suzy. This is the one decor item that I have a hard time relating to. Not sure why, but no matter what type, I just don’t get the ‘feels’ for it. =/ However, this design and ease of use is GREAT! Looks like to changed up your site a bit. 🙂 Fun! I love your red, white and blue banner. It is so pretty. And the red flowers are so festive! Beautiful! Love your banner! Too cute! for different occasions. Of course, my favorite is patriotic. Cute, cheap, easy…what more could you ask for!! The banner is so cute and I love the fact that you don’t have to sew it!